No WIMPS* in this Dark Matter. What kind of thinking creates tools to deal with the unknown?. Of the arts and humanities, Rachel Armstrong**, specialist in architecture and synthetic biology, black sky thinker, says they ”can expand the power of research by creating visualisations of what is currently an unknowable and unpredictable solution”. Hylozoic Ground. 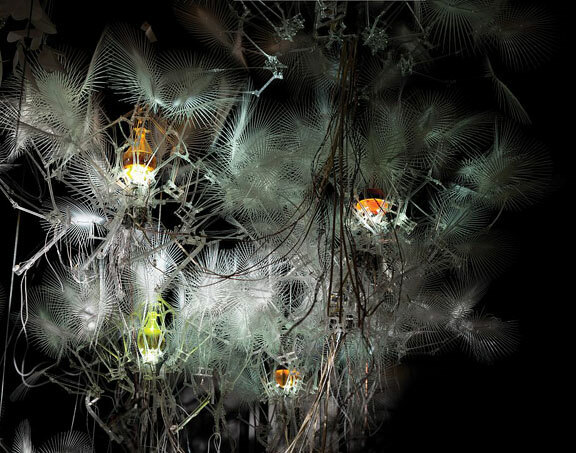 Installation in Mexico 2010 by Philip Beesley with Rachel Armstrong’s protocells credit Pierre Charron. On the west coast of Turkey, near the town of Balat, lie the ruins of Miletus, which in the 6th century BCE, was the most important city in the Greek world. Here Anaximander, engineer, scientist and philosopher, was brought up. The city teemed with traders from Ethiopia, the Ukraine, Italy, France, Asia Minor, the rest of Greece and political power passed between merchants, craftsman and aristocrats, while the Persian Empire, with its static structure of divine kings, priestly caste and civil service, was an ever present threat. The conditions were ripe for a new kind of thinking: scientific thinking. 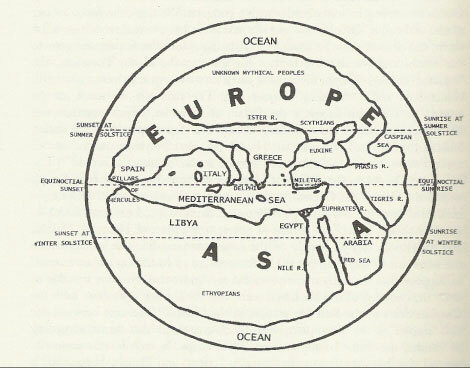 Anaximander was the first person to say the world floated freely in space; that it wasn’t flat, but cylindrical. It makes perfect sense, because you can see the stars disappearing, then reappearing, but no-one had thought of it before, because it entailed a complete disruption of a world view which had been in place, working quite well, for centuries. He overturned this by posing a different question: not ‘what stops the earth from falling?’, but ‘why should it fall?’ His concept was of a planet held in suspense by being at a point of equidistance from – whatever surrounded it. Another innovation concerned the very beginning of things. He imagined that the universe began from a natural phenomenon he called ‘apeiron’ which means ‘without limits’, ‘boundless’ or ‘undifferentiated’. This might sound vague and archaic, but frankly it’s not dissimilar to our expression ‘dark matter’. He was creating a concept which, even though it isn’t knowable through direct experience, made it easier to construct an explanation of the world. Significantly, given the established assumptions of his time, it was natural, not divine; it had no limits; it wasn’t something familiar: water, or air. “Boundless’ is not a bad description for a generative force which creates everything and is still, even now, unexplained. Centuries later, Faraday posited the existence of electric and magnetic fields. It’s an approach which has served science well. Anaximander said thunder was caused by clouds colliding, earthquakes were fissures created by excess heat. He thought life originated in the sea. He understood that the sun evaporates water from sea and rivers and returns it as rain, and concluded there were natural laws keeping the world in balance through a process of constant exchange. These are new concepts developing out of a process of observation and an intelligent imagination which creates abstractions to explain phenomena. He had a mentor, the engineer and philosopher Thales, who said that water was the primary matter in the universe. 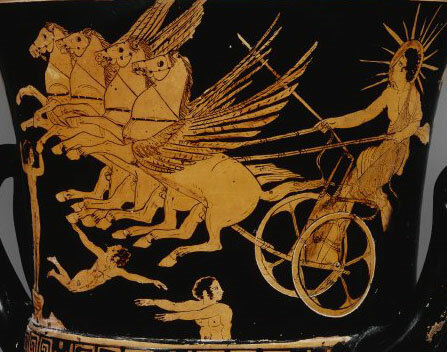 Anaximander took this idea on board, but completely reconfigured it. This is ‘third way thinking,’ a kind of respectful rebellion, in which old theories are built on, or stimulate alternatives. It’s an antidote to ‘ binary thinking’: ‘either/or statements in which a small flaw destroys the whole, where compromise or adaptation is so threatening it results in entrenched, inflexible thinking. Fascinatingly, the history of scientific discovery constantly refines and reshapes our concept of reality. It’s truths are always questionable, but even theories that are proved incorrect, can have validity. The collaboration of observation, visualisation and reconstruction, began with Anaximander. Of course he’s been misunderstood, but personally I think a posthumous Nobel Prize is in order. * Weakly Interacting Massive Particles, one description of the content of dark matter. ** Rachel Armstrong is co-director of AVATAR (Advanced Virtual and Technological Architectural Research) in Architecture and Synthetic Biology at The School of Architecture and Construction, University of Greenwich, London. It sometimes takes someone who is not a classicist to recognise the importance of ancient authors and I’m indebted to Carlo Rovelli’s book: ‘The First Scientist: Anaximander and his Legacy’, for many of the insights noted here and to Dirk Couprie’s ‘Anaximander in Context’ for his subtle and scholarly interpretations of sources. This entry was posted on 30 August, 2017 in homepage and tagged Simone Witney. Bookmark the permalink.